March 15, 2013, HERSHEY, PA —- The outrageous, inaccurate, and, at times, outright false comments recently made by Penn State Trustee Kenneth Frazier are, unfortunately, indicative of the attitude exhibited by the Board of Trustees since November 2011. Instead of accepting responsibility for their rush to judgment, the Board allowed Mr. Frazier to make incendiary statements and allegations that will do nothing to further the progress of Penn State. In addition to offering his own, personal outlandish interpretation of information, Mr. Frazier contradicted himself, misstated the law and thefacts, and grossly exaggerated the quality and completeness of the Freeh Report. Mr. Frazier admitted that Freeh, Sporkin & Sullivan promised todeliver a thorough, complete and independent review. However, in reality, they failed to do so in all respects. “Apparently, Ken Frazier and his Task Force bought the Freeh Report, both figuratively and literally. However, both the former Attorney General of the United States and one of the world’s foremost authorities on serial pedophiles have concluded that the Freeh Report was neither thorough nor complete, and that its conclusions were wholly unsupported by fact,” said Robert Tribeck, attorney for the Legal Task Force of Penn Staters for Responsible Stewardship. “I trust the opinions of Governor Thornburgh and Mr. Clemente a bit more than those of Mr. Frazier in matters of this nature,” he quipped. In September 2012, PS4RS issued its own independent review of the Freeh Report. The conclusions of the PS4RS Review were confirmed by the reports of Governor Thornburgh and Mr. Clemente. Mr. Frazier has repeatedly attempted to shift blame and to create a narrative that the concepts of seeking the truth and protecting children are mutually exclusive. That false narrative must stop. PS4RS is and remains committed to the protection of children and fully supports efforts and actions by Penn State to become a leader in protecting the rights of children. However, as is supported by the continued growth in membership of the organization, PS4RS will not sit idly by while Mr. Frazier and his cohorts continue to proffer fantasy as fact and hide the truth regarding the failures of the Board of Trustees in responding to the events of November 2011. Penn Staters for Responsible Stewardship, with more than 18,000 members worldwide, was formed to effect positive change within the Penn State University Board of Trustees. 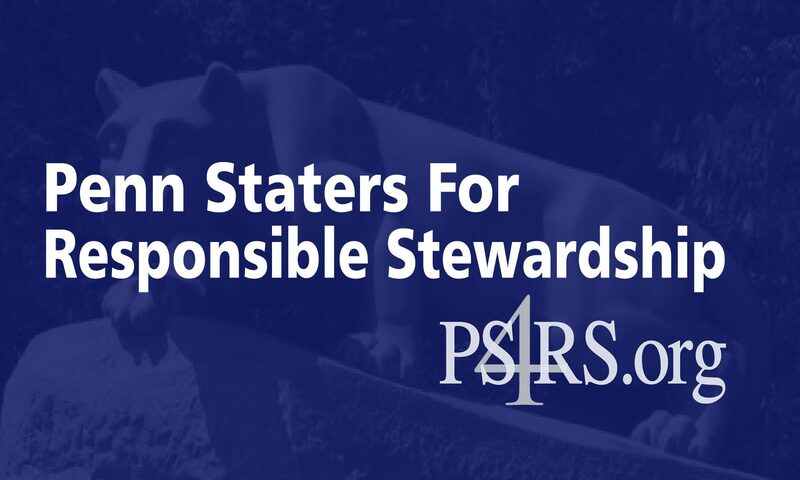 Penn Staters for Responsible Stewardship will endorse three candidates for the upcoming 2013 Board of Trustees election. For further information on PS4RS, please visit http://www.PS4RS.org, email ps4rsinfo@ps4rs.org, or go to http://www.facebook.com/PS4RS. Follow PS4RS on Twitter at @PS4RS. Maribeth — this is soooo perfect! When your media budget is severely limited, there’s nothing like a family feud to get coverage! God bless Frazier and his big mouth!